Ustream.TV Wins CNET’s Webware Top 100! CNET Top 5 Editor’s Choice! CNET’s Webware today announced the winners of the Top 100 sites of Web 2.0. Over the course of 20 days in May and June, the community of Webware.com users voted for its favorite Web applications. These are the results: the top 100 Web apps, 10 in each of 10 categories, determined by Webware readers and the fans of the sites that made the final cut. There were more than 5,000 nominations for sites to be included in this awards program, which Webware’s editors pruned to a list of 250 finalists. 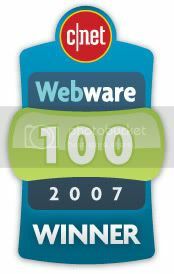 Users then voted on those finalists–there were 489,467 votes cast–to come up with these: The top 100 Webware sites for 2007. Ustream.TV also was selected as a Top 5 Editor’s Choice by Rafe Needleman (see video here). Senior Editor Rafe Needlemen says of Ustream.TV, “This is the future of the internet.”Â Ustream.TV is in great company as other winners included in the Media Category are Youtube, Flickr, Fotki, Photobucket, LastFM, Pandora, NetFlix, Zooomr, and Yahoo Videos.Â Ustream.TV was the only live video streaming site selected. A special thanks to all the Ustreamer’s out there who voted and made this possible. Graduationcast! 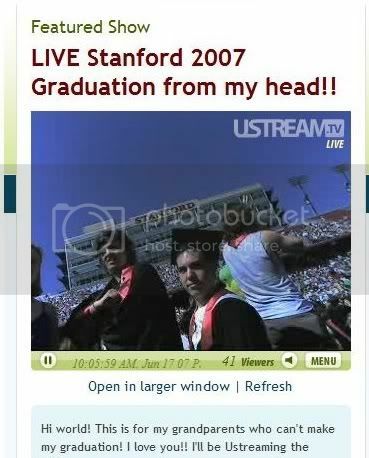 Stanford University Student Streams Graduation LIVE From Her Cap! Is Ustream.TV becoming mainstream? Stanford thinks so. 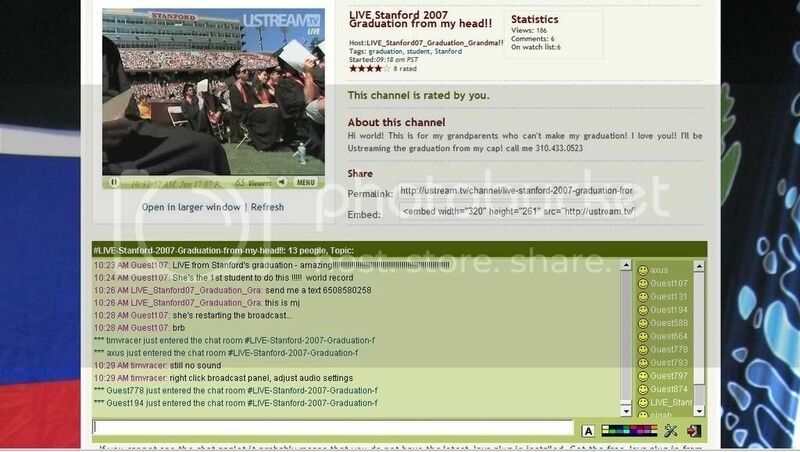 In a Internet and Ustream.TV first, Stanford University student Marie Jo Mont-Reynaud attached a webcam to her graduation cap and streamed the entire Graduation Commencement LIVE on Ustream.TV. She even had a live chatroom and was able to interact with friends and family during the ceremony. That is cool. That is mainstream. This stream was also embedded into the Stanford University Blog for other parents and relatives across the country to witness. Hundreds of friends and relatives tuned in to watch live. By Community we mean the wonderful and creative Ustream.tv broadcasters, viewers, and users. By Leadership we mean the act of facilitating the growth and nurturing of our community. Ustream.tv strongly recognizes the importance of our community. Ultimately it is you that has made Ustream.tv the most recognized live streaming site on the internet. You can understand more out the role of a Community Leader/Evangelist/Advocate/Manager HERE. Ustream.tv is proud to announce its selection as a finalist in CNET’s Webware “Top 100” services of Web 2.0. 25 finalists in 8 categories were selected by CNET staff based on their impact and popularity in Web 2.0Â These finalists are then voted on by the world to form the “Top 100”.Â Ustream.tv was selected for the Media: Audio, Video, Photo category is such company as Youtube, Flickr, Myspace, and Netflix. “This demonstrates Ustream’s continued leadership in the live video space and a testament to the future rise of live video on the internet” says Chris Yeh, CEO of Ustream.tv. The world is quickly learning the power of live interactive video.Â It is no longer about consuming, but about experiencing. So where is Ustream.tv having an impact and making its power known? Music and Politics. For the past week, Jonathan Coulton (jonathancoulton.com) has been recording a new song called “Octopus”. 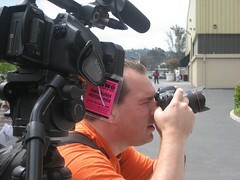 He has been broadcasting the entire process via Ustream and showcasing the video on his site. (Watch Jonathan Coulton Here). Trying to gain some fame and get exposure, GavinCountry streams live from his studios in Nashville, TN each night interacting with fans and taking requests (Watch Gavin Here). The Young Democrats of Atlanta are utilizing Ustream.tv to organize and strength their community (Watch Video Here) as well.Â They have recognized that Ustream.tv can help deliver their message and broaden their support. Interaction and Experience are being redefined.Â Live. Democratic Presidential Candidate Senator Chris Dodd made internet history today by streaming LIVE through Ustream.tv where he took questions from a variety of internet blogs around the web. It was all LIVE. You can learn more about Chris Dodd by visiting his website at www.chrisdodd.com. Ustream.tv allows anyone with a video camera or webcam to stream live, interactive video to a global audience. Ustream.tv is building a flexible and easy-to-use platform that allows its users’ creativity to flourish. Already Ustream.tv has seen broad acceptance bloggers/podcasters/vloggers, bands, citizen journalists, and lifecasters. Founded by two West Point graduates, Ustream.tv continues to explode as the fastest growing company of Web 2.0. I’ve been looking at online video for about a month now, spending less than an hour on most days, just poking around. There’s so much going on, in so many areas, that this approach is very much like assaulting a glacier with an ice pick. Except that even a glacier on steroids would not come close to keeping up with this rapidly growing, rapidly changing category. Over half the web’s content is now digital video, my friend JD Lasica, a citizen video expert says. He says many predict the web will eventually be 98 percent video. This changes things. It changes how the Internet will be used. Some of this is just a new and better distribution mechanism. For example, the day is fast coming when you’ll be able to get whatever commercial TV or video program you want from your computer and wirelessly send it to your TV set for viewing whenever you want. Cable providers need not be involved. There’s also the new pro0am explosion best typified on YouTube. But there is much more happening and from time-to-time, I plan to write about the companies and people who stand out in my perception as the diamonds in the coal mine, companies and people who are changing the nature of the online experience. Of the companies I’ve come across so far, nothing has so impressed me as Ustream. Chances are good that you’ve already heard of Ustream, despite it’s tender age of four months, and despite the fact that the company consists of three guys, no financing and a few off-the-shelf cameras, cables and baseball caps customized for hands free video recording. 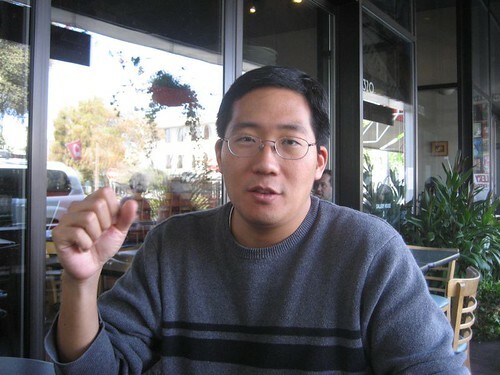 I am almost equally impressed by its CEO Chris Yeh, a sequential entrepreneur who seems to fully grasp Ustream’s potential and has the smarts and experience to help this tiny company change the world. Like most enduring ideas, the Ustream concept is just plain simple. 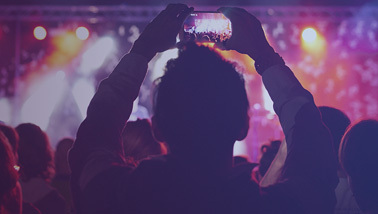 Ustream allows just about anyone to broadcast live video over the Internet and interact in near realtime with connected viewers using chat. Unlike Justin.tv, which features the novelty of some guy walking around (or sleeping) with a camera on his head, Ustream is intended as a platform, working with most other sites. In fact, during my two meetings with Chris Yeh, he was consistent. Every time I mentioned another company, he told me how Ustream could work with them, rather than compete with them. The platform play is proving to be key. While Justin is based on the oddity of you watching a one guy’s life, even during the portions that are less interesting than paint drying, Ustream’s home page is diverse and wonderfully uneven in the quality and subject matter. It seems to have something new every day. Most is end userist in orientatation, but a growing tributary reveals considerable business applicability as well. More about that in a minute. First, a brief capsule of the company’s brief history. Ustream got early prominent coverage on some major blog sites. But where it really showed its potential was at Web 2.0, the recent mega conference, when Podtech’s dynamic duo of Scoble and Owyang walked around talking to people and showing presentations as they happened with hundreds of viewers worldwide commenting through text chat. 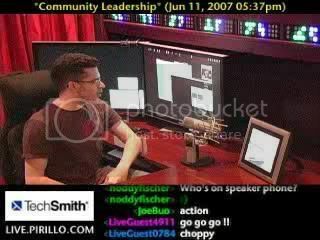 Shortly after, Ustream got a second boost from Gnomedex ubergeek Chris Pirillo who has extended his own live TV show onto the Ustream platform where about 100 people seem to be watching it, even during lengthy intermissions when the screen is essentially inactive. Now, new experiences are popping up faster than microwave popcorn. Just a few from the last week. When Zoomr, a photo sharing site headed up by respected photo blogger Thomas Hawk, needed to close down for updating, the company thought it might be cool to use Ustream to show what was going on behind the scenes, instead of posting the usual “Closed for Repairs” screen. It turned out to be more than cool, according to Hawk. “It let us interact with our community and get a lot of feedback about how to make Zooomr a better place going forward.” Hawk told me that Ustream helped Zoomr to get to know its own community better than they had imagined they could. “More than anything it’s just been a ton of fun,” he added. Moving forward Ustream, whose new site is scheduled to go live tonight, has Ustream built in to it, running 24/7. Sometimes the Zoomr senior team will interact directly with its community and at others, they’ll just run some videos. One other plus seems to have come out. Even with the site down for the past week, the number of visitors has increased.” People seem to like this a lot,” he said with apparent understatement. Cisco, a company with a very yesterday image has been trying to get caught up with contemporary times. Last week it Ustreamed a news conference that it held in Second Life, which seems to me to be about as hip and cool as one can get. A father had looked forward to seeing his daughter graduate high school, but got struck by leukemia and was hospitalized for treatments. Friends Ustreamed the daughter’s graduation ceremony which he watched with delight from his bed. A Chinese movie superstar does a Ustream news conference for fans. In fact start watchers and amateur paparazzi seem to be moving from the flash cameras to video cams, using Ustream to live broadcast start sitings. Ustream co-founder Johnny Ham has the dubious achievement of live streaming Paris Hilton’s parents in one of Ustream’s first ever programs. 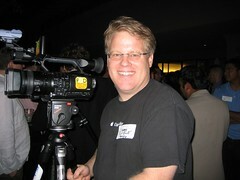 “Events,” as Scoble calls them, may involve any part of life. As Carl Sagan used to say, “Consider the possibilities and they are infinite.” Soldiers in Iraq, where Ustream co-founder Johnny Ham was recently stationed can talk live with their family from the war zone and their families can talk to them. A CEO of a global corporation can hold a companywide interactive video meeting with inexpensive off-the-shelf equipment. Elected officials, if they dare, can hold interactive video conversations with constituents. A surgical specialist in one location can oversee an operation remotely and provide text consultation that could save a life. I believe that modern citizen journalism began not with blogging, but with the amateur video taping of the LA police beating of Rodney King. That took several days for the person who filmed it to get it played on a TV station whose network then picked it up. Social media just makes such opportunities easier, faster and cheaper to send because we all have access to a network and we all have the ways and means to report what we see. Ustream takes it a step beyond where we have been because now we can video report live. Almost anyone with a $99 camera and an Internet-connected report can upload to Ustream. Today, most of us will be tethered to our computers via USB cables. But we will all soon be unleashed. In April, the Nokia N95 video phone came out making it possible to upload directly from a video camera phone. It’s expensive today, but the time is not far away when the average device will afford millions of people with the same capability. It is highly unlikely that Ustream will move forward without facing new and tougher competition. Perhaps it will come from another innovative startup. More likely a large internet or traditional media company will move into the space. Yeh believes that Ustream’s competitive edge will come from an 18-month headstart. By the time a startup can get to where Ustream is today, Ustream will be somewhere further down the line. As far as competing with a giant like either Google or CNN, Ustream is probably easier to eat than beat. Yeh did not share with me his business plan, but it is obvious, the company is going to have some pretty nice options on the road ahead. The road ahead seems to have no major barriers, but it is filled with speed bumps. One main problem is being heard. It is a tiny company, and the buzz about Ustream is only audible among innovators and early adopters in social media circles. It may shock you, but blogs do not actually reach most of the people in the world. They do not even reach most of the people on the Internet. they don’t even reach most of the people who speak English on the Internet. Ustream will need a very active communications outreach programs to keep the headstart it has. This may be it’s biggest challenge. There is also an emerging problem of discoverability. Video is harder to scan than text, and current search engine spiders just don’t work. Over at YouTube, it seems harder to fiund what you want without getting muddled in a swamp en route. Even Ustream’s 4-month-old archives is getting pretty big. Archives is not their core business, but it will be important to users. I raised the issue with Yeh, who wisely opted not to discuss confidential business plans during an on-the-record interview, but he seemed confident that Ustream will be able to resolve the issue. I can’t wait to see how. I’m pretty bullish on this company, but of course, I could be dead wrong. There could be a group of guys meeting somewhere right now, with something so much better as to blow right past Ustream. What I am certain about is that live streaming video is very important over the next few years social media and the Internet. Live streaming video is going to be mainstream. The numbers are going to be huge and as of this moment, Ustream is in the best position of any company that I have been able to find. This week, a new version of CamTwist will be coming out (version 1.4) and Ustream.tv streamers are excited! CamTwist has quickly grown as the most popular Ustream.tv streamer application. It gives you professional functionality of a live production studio on Ustream.tv. Popular Ustreamers such as Chris Pirillo and the Technology Evangelist are using CamTwist to improve their live video productions. We interviewed the developer and creator of CamTwist, Steve Green, to gain a better understanding of CamTwist. In short, CamTwist is a software package for Mac OS X 10.4+ that lets you add special effects to your video chats. Technically speaking, CamTwist will work with any application that supports QuickTime compatible cameras but the intention was to create something fun for video chats. It’s also possible to stream your desktop still images, and movies. Best of all, CamTwist is totally free. When and why did you create CamTwist? 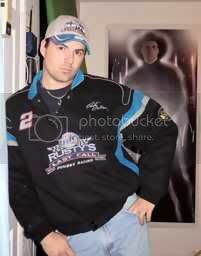 I started CamTwist in late 2006. I was spending a lot of time chatting with friends on various streaming sites and the chatters with Windows were having a lot of fun with a program called WebCamMax. I thought it would be great to have something like that for Mac OS and I hated the idea that my chat mates with Windows were one-upping us Mac users. What features do you personally like best? I think the Matrix and Flame effects are the coolest. Both of those effects are based on open source projects typically run on Linux. 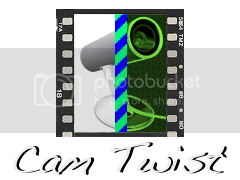 Honestly speaking, I hardly ever use CamTwist myself. What impact do you feel CamTwist is having on sites such as Ustream.tv? Until several weeks ago, I didn’t know that Ustream.tv even existed and I certainly didn’t think that CamTwist would have impact on anything. CamTwist was intended as a toy after all. I’ve since been contacted by several well known Ustream.tv users asking about features and giving me feedback. I was thrilled to learn that people were using CamTwist for more serious business. As for impact, I could only guess about the impact to Ustream.tv but I can say for sure that Ustream.tv has had an impact on CamTwist. How can someone cue up a video, picture, or desktop display for a Ustream.tv video during a live feed? CamTwist now has the ability for you to setup another “scene” without disturbing your live stream. In the advanced settings drawer, when you enable the staging area you can select another video source and/or other effects. There is a small preview display and when you’re happy with the results, you can push the staged settings into the live stream. What can we expect from CamTwist in the future? That’s a hard question to answer. I’ve got a list of features that people have requested and I have my own list of ideas but work on CamTwist only happens in my spare time. In general, I tend to work on features that I feel are useful to the largest groups of users. How can someone donate to help future versions of CamTwist? The best way to help future versions of CamTwist is to work on new effects. A lot of the cool CamTwist effects are implemented with Apple’s Quartz Composer tool. Given that hacking with Quartz Composer isn’t for everyone, the second best way to help is to send me email with ideas for new effects and features. Where can you download the latest version of CamTwist? 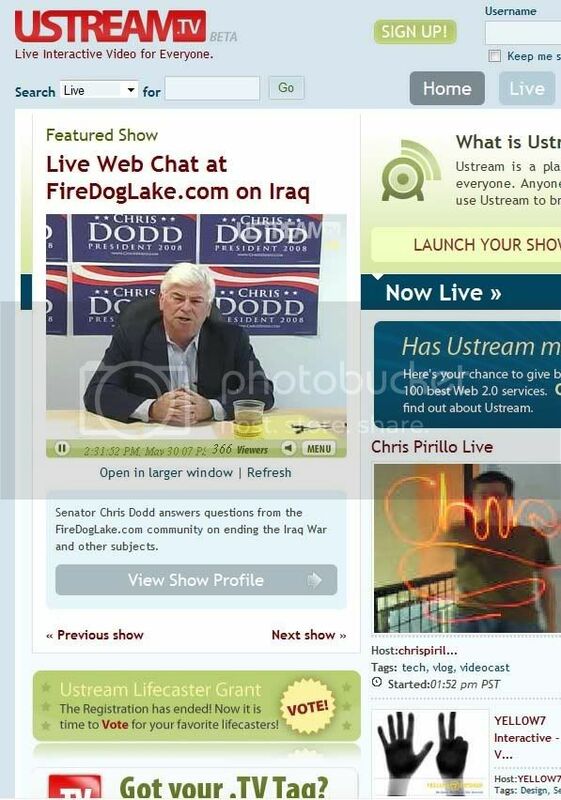 Presidential Candidate Chris Dodd on Ustream.tv! Today at 1pm EST, Ustream.tv is very lucky to have PresidentialÂ Candidate Senator Chris Dodd streaming LIVE Live from Drake University in Des Moines, Iowa. This event is for a statewide discussion on how to end the war in Iraq. Click the banner below to tune in today at 1pm EST! Also, please visit http://www.chrisdodd.comÂ for more information.